1. What Is Difference Between Cisco SFP+SR And Other Cisco 10G Optical Modules? 2. What's the difference between SFP-10G-SR and SFP-10G-LR? 10GBase-SR and 10GBase-LR are two different 10 Gigabit Ethernet specifications. The "SR" in 10GBase-SR stands for "short range", which supports a shortwave 64B/66B (Wavelengths is 850nm) multimode fiber (MMF), the effective transmission distance of 2 ~ 300m. To support 300m transmission, it needs to use the optimized 50μm diameter OM3 (Optimized Multimode 3) fiber (no optimized diameter 50μm fiber called OM2 fiber, and the diameter of 62.5μm fiber called OM1 fiber). This specification has the lowest cost, lowest power consumption and the smallest fiber module and other advantages. "LR" in 10GBase-LR refers to the "Long Range", which supports longwave (1310nm) single-mode fiber (SMF) with 64B / 66B encoding, with an effective transmission distance of 2m to 10km. In fact, it can reach 25km. this specification has small, low power consumption, long transmission distance etc. characteristics. 3. What's the difference between SFP-10G-SR and SFP-10G-SR-S? As we know, SFP-10G-SR-S is Cisco Non-S-class optics, SFP-10G-SR is Cisco S-class optics. According to Cisco, S-class optics are designed for enterprise and data center 10G and 40G applications (don’t scale down to 1GbE). This new set of optics does not have unnecessary features for these applications, so the Non-S-class optics cost more than the S-class’s. Besides, S-class is Ethernet only, no OTN (Optical Transport Network) or WAN-PHY (Wide Area Network Physics). In addition, it is no TAA compliance for S-class. 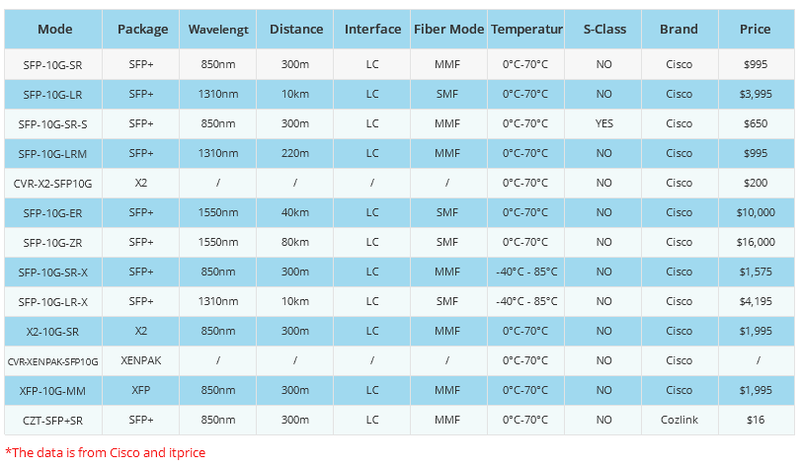 Thirdly, S-class and non-S-class optics are with different temperature ranges. Thus, if you are an enterprise or data center environment that doesn’t need any special long distance, temperature tolerances, or other special features, S-Class optics are cheaper and should be just fine for you. 4.What's the difference between SFP-10G-SR and SFP-10G-T? Both of the SFP-10G-SR and SFP-10G-T are hot-pluggable with a managed soft-start and are interoperable with any SFP+ cage and connector system. However, they have total different performance when plugging into the 10G switches. SFP+ 10GBASE-T module uses the Cat6a cables for a link length of 30 m over RJ45 connectors. SFP+ SR operates over OM3 cables with a distance of 300m over LC connectors. Besides, 10G SFP+ transceivers are nowadays much cheaper than the newly released 10G copper module. 5.What's the difference between SFP-10G-SR and SFP-10G-LRM? The "LRM" in 10GBase-LRM is short for "Long Reach Multimode"(Long distance extended multi-point mode), which is mainly used for long-distance multi-point connection mode. The corresponding standard is 2006 released IEEE 802.3aq, using 64B / 66B encoding. The Cisco 10GBASE-LRM Module supports link lengths of 220m on standard Fiber Distributed Data Interface (FDDI) grade Multimode Fiber (MMF), using 1310nm lasers.And also supports link lengths of 300m on standard Single-Mode Fiber (SMF, G.652).However, SR stands for Short Range, these Cisco 10G SR transceivers support link length of 300m over multimode fiber and use 850nm lasers. 6.What's the difference between SFP-10G-SR and X2-10G-SR? Both SFP-10G-SR and X2-10G-SR support link length of 300m over multimode fiber and use 850nm lasers. But they are Cisco 10G two different package.SFP-10G-SR modules belong to SFP+ package and used in SFP+ slots. And X2-10G-SR modules belong to X2 package and used in X2 slots. Besides, Cisco 10GBASE-SR X2 optical transceiver is with dual SC connector, 10GBASE-SR SFP+ transceiver is with dual LC connector. 7.What's the difference between SFP-10G-SR and SFP-10G-ER? Basically, ER stands for Extended Reach, and can achieve transmission distances of up to 40km over single-mode fiber. And use 1550nm lasers. cross-compatible. SR stands for Short Range, these transceivers support link length of 300m over multimode fiber and use 850nm lasers. 8.What's the difference between SFP-10G-SR and SFP-10G-ZR? ZR also stands for Extended Reach which can transmit 10G data rate and 80km distance over single mode fiber and use 1550nm lasers. Actually, ZR is an unofficial format, which is not technically part of the IEEE 802.3ae standards for networking hardware. It pushes the range of single-mode ER fiber out to 80km. SR stands for Short Range, these transceivers support link length of 300m over multimode fiber and use 850nm lasers. 9. What's the difference between SFP-10G-SR and SFP-10G-T-S? SFP-10G-T-S is Cisco 10G copper modules, it has the same parameters with SFP-10G-T. 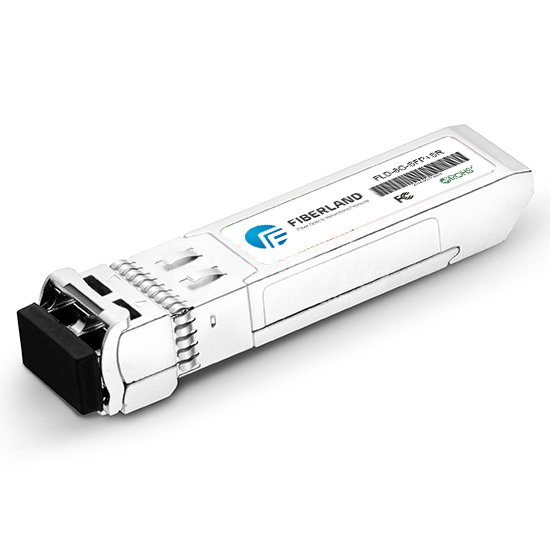 The SFP+ 10GBASE-T module uses the Cat6a/Cat7 cables for a link length of 30 m over RJ45 connectors. SFP+ SR operates over OM3 cables with a distance of 300m over LC connectors. 10.What does -X signify, as in SFP-10G-LR-X or SFP-10G-SR-X? Whenever you see -X, that means it has extended the ability to operate under wider temperature variation, from -40°C to 85°C (-40°F to 365°F). There is no other significant difference from the standard versions, and no reason to use -X equipment unless you're operating in extreme temperatures. By comparison, standard transceivers are generally restricted to operating temperatures from about 0°C to 70°C (32°F to 158°F). 11.Can we use SFP optical module in SFP+ slots? We are often confused about the compatibility of SFP and SFP +, and we are puzzled that we do not know if we can use the SFP optical module in SFP + slots , the problem for many engineers is a headache. Actually, the SFP optical module can be inserted into the SFP + port in most cases. As a rule of thumb, the SFP optical module can operate in the SFP + slot, but the SFP + optical module can’t run in the SFP slot. When you insert an SFP module on an SFP + port, the speed of this port is 1G instead of 10G. Sometimes this port will lock the speed at 1G until you reload the switch or do some commands. In addition, SFP + ports usually can’t support speeds below 1G. In other words, we can’t insert the 100BASE SFP optical module on the SFP + port. In fact, for this problem, it depends largely on the switch model, sometimes SFP in SFP + port support, sometimes not supported. For example, all SFP + ports of almost Cisco switches can support SFP optical modules, and many SFP + ports of Brocade switches only support SFP +. While it is often feasible, the information provided by the switch supplier is more secure. 12. How To Choose The Suitable Fiber Patch Cables For Cisco SFP-10G- SR transceiver? Besides, Cisco SFP-10G-SR is the 10GBASE-SR SFP+ transceiver module for MMF, 850-nm wavelength, LC duplex connector. So if you want to choose a right patch cable using between Cisco fiber optic transceiver SFP-10G-SR , you would require patch cable with LC-LC connector with MMF, 850-nm wavelength. In the same way, we could choose right fiber patch cable for our other transceivers. 13. How are single-mode and multimode fiber different? In fiber-optic communication, single-mode fiber (SMF) is for remote signal transmission. Light in the single-mode fiber is along the straight line to spread, no reflection, so its propagation distance is very far. Multimode fiber (MMF) is mainly used for short distance optical fiber communication, such as in buildings or on campus. Multimode fiber can carry multi-channel optical signal transmission. 14. Can Cisco SFP+ Transceivers Be Used In Other Brands Equipment? In order to save the cost, users always hope they buy one module and can use it in different brands equipment. So they often ask one similar question: Can I use Cisco transceivers in Huawei or HP switch? Obviously, the answer is NO. As we know, Huawei, HP equipment, and Cisco SFP+ transceivers all have the special encryption. The switch verifies the key at runtime, if the SFP+ does not contain a valid key, the corresponding port will be shut down and the port will not be able to send or receive any packets until it has inserted a valid SFP+ module. In fact, the original optical module is not the only choice for users, there are many third-party modules, which can be well compatible with Cisco equipment. Fiberland CZT-SFP+SR is not only compatible with Cisco SFP-10G-SR but also well compatible with other third-party optical transceivers. Under normal circumstances, the price of third-party optical module is more competitive than that of the original brand. Fiberland has one-stop service for your network. All above fiber optical products can be found in our website. Welcome to contact us! ⑥ Always wear an antistatic wrist strap to prevent damage to the electrostatic discharge. ② When removing the optical module, please pull out the rod, and then remove the optical module through the rod, forced to remove the optical module. A man's life is not always smooth, there will always be problems. The same is true for optical modules. The problem is normal, we have to learn from the problem, then it will be improved. Today we come to summarize the problems encountered in the work of the optical module. As the optical interface pollution and damage caused by optical link loss becomes larger, resulting in optical links unreasonable. Optical module optical port is exposed to the environment, dust enters the optical port and causes pollution. The used optical fiber connector end face has been polluted, the optical port of optical module is secondary pollution. The fiber optical connector with pigtail is misused, the end face is scratched and so on. Use poor quality fiber optic connectors.